We all know the maxim “You are what you eat,” and this idea has never been more true or obvious than in the fattening of America in the last generation or two. Since the start of my most recent vegan challenge, I feel like I have improved my overall diet by a huge margin, particularly since I am not eating cheese. Cheese is full of calories, mostly in the form of milk fat, and doesn’t offer much nutrition to an adult. When this challenge is over, I might re-integrate hen’s eggs into my diet (especially the farm fresh eggs Abby’s co-worker brings us), since eggs can have a place in healthy nutrition, but I don’t know if I will start eating cheese again. 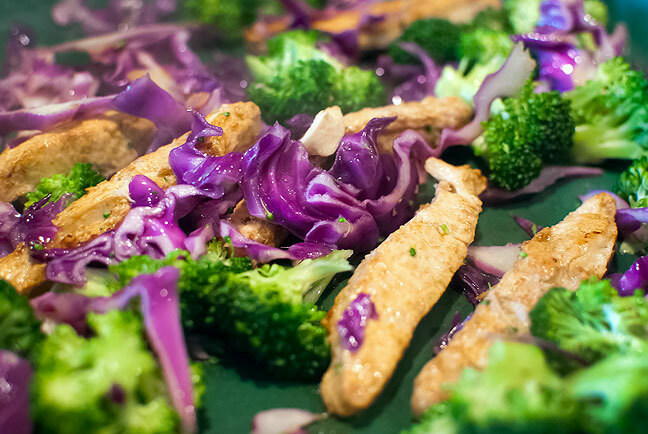 My new favorite meal is a wrap that contains red cabbage, broccoli, onions, and Gardein Veggie Chick’n Strips, sautéed in olive oil, lightly salted and peppered. As you can see, the color in the vegetables in this image, often an indicator of their nutritional content, is excellent. I’ve never understood the fascination with cheese. Over the course of my life, I’ve watched restaurants add “with cheese” or “covered in cheese” to nearly every menu item that exists. Going to people’s houses (which isn’t often for me), I’m always shocked at the piles of cheese everywhere, mixed into everything, and melted onto other things. I’m one of those oddballs who has a mild (unmentionable, though) reaction to it, so I quit eating it as a youngster and eventually quit liking the taste of it. I don’t, however, attribute my perpetual thinness to not eating cheese. In my wife’s case, she had to stop eating *everything* dairy since our son was nursing and developed an early and awful dairy allergy. Not just lactose, understand, but milk proteins; anything that cow milk had touched. She immediately lost all her pregnancy weight and soon was the thinnest she’s been in the nine years I’ve known her. She *does* attribute her thinness to not eating cheese & related products. I really like cheese, especially interesting varieties. But I’ve noticed the odd addition of cheese where it doesn’t belong, too — not so much in restaurants, but in my own home. Salad? Meh. OK, but not for me. Eggs? I’ve heard of that, but no thanks. Meatloaf? RED BEANS?!? And Will, I must chime in. Your wife lost the weight because she was nursing and generally caring for an infant; it’s made two of my friends hypermetabolic, even. Correlation ain’t causation. LOL. No, of course correlation isn’t causation. However, the cutting out all dairy was the only difference in her behavior between the two post-pregnancies. With our daughter (first child), she lost all the weight over several months of nursing. With our son (second child), the weight wasn’t going down as quickly. She got stuck at X pounds until she cut out dairy entirely — then the remaining weight dropped off within weeks.